In case you haven’t heard, travel publisher and website Lonely Planet drew ire over a video that claims that Ifugao’s Banaue Rice Terraces were made by the Chinese. The video, which was originally posted on Facebook, was caught to have the following text: “These mudwalled terraces were first built around 2000 years ago by the Chinese.” No source was cited to back this statement. Netizens were quick to point out the error in the video, defending that it was the Philippines’ indigenous people who built the terraces. Lonely Planet took down the video since it went viral and vowed to look through it. As of writing, Lonely Planet has yet to issue a formal statement regarding the matter. The actual age of the terraces, however, remains a mystery to this day. American anthropologists Roy F. Burton and Henry Otley Beyer assert that the terraces are over 2,000 years old. On the other hand, a number of scholars also argue that the terraces merely date back to the arrival of the Spanish in the country. A 2019 study published in the Journal of Field Archaeology show that the earliest obtained radiocarbon dates from the site were from 1867 B.C, while noting that the “earlier dates do not imply the presence of irrigated rice agriculture.” Previous research made it difficult for archaeologists to determine the exact age of the terraces due to modern-day agricultural activities. But here’s a fun fact: In the same study, it was shown that Banaue happened to be far more advanced in its time. It has an extensive agricultural system that goes beyond the grand flight of rice terraces that we normally see. 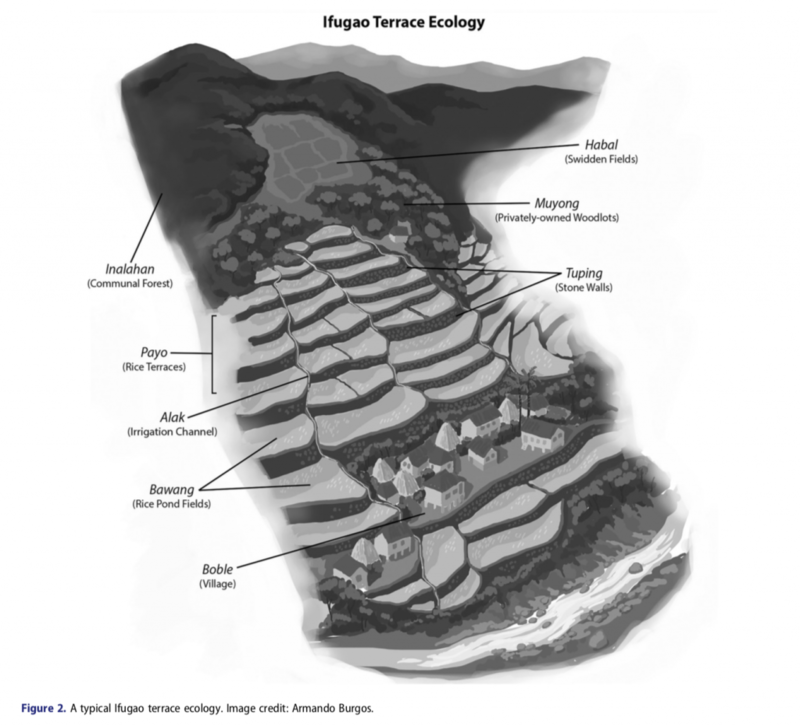 The Ifugao terraces’ ecology had two types of forest cover: Inalahan, which comprises of “upslope public forests” that had open-access to communal areas, and muyong or privately-owned woodlots. In between inalahan and muyong was a field called habal, which were “unirrigated slopeland, cultivated with root crops.” The rice terraces are called payo, which are protected by stone walls called tuping and irrigated through a channel called alak. At the foot of the terraces is a village called boble. Today, local farmers continue to plant tinawon—an indigenous rice variety that grows within nine to 10 months. The local industry also continues to flourish with the increasing amount of tourist arrivals every year. With these details in mind, it all boils down to the fact that the heritage value of the Banaue Rice Terraces’ doesn’t mean any less just because its actual age is unclear. More than that, the terraces have brought livelihood to the people of Ifugao for hundreds of years. It’s a natural wonder that, as multiple studies agree, is created solely by the people who lived there in the first place. Not the Chinese, not by anyone.